Rebecca (Miner) Bateson was born on April 4, 1815, likely near Sego, Perry County, OH, the daughter of Frederick and Elizabeth (Sechman) Miner Sr. She died only a few months before her 100th birthday. On June 9, 1836, in neighboring Fairfield County, the 21-year-old Rebecca married 25-year-old farmer William Bateson (1811- ? ), a native of Perry County. They are said to have resided in Rehoboth, Perry County. Later, sometime before 1850, they moved to Walnut Township, near Millersport, Fairfield County, OH, owning tracts along Buckeye Lake. The Batesons were the parents of five children -- Samuel James Bateson, Nancy Jane Warner, Sarah A. Carey, William H. Bateson and Margaret C. Bateson. Rebecca was not a member of any particular church, but "was a firm believer in the Baptist doctrine and enjoyed their services whenever possible," said a news article. "She was a good citizen, a kind friend and neighbor and a noble wife and mother." She is said to have smoked a corncob pipe, but never when her adult children or grandchildren were around. In 1860, youths named Margaret C. Bateson (age two) and Samuel Yost (age one) resided in their home in Walnut Township. Their precise relationship to the family is unknown. In 1869, the Batesons said farewell to their married daughter and son in law, Nancy and Benjamin Warner, who left Fairfield County and ventured westward to Illinois as pioneers. They settled on a farm near Filson, Douglas County, IL. While the Warners remained in that county the rest of their lives, they maintained contact with their relatives back home in Ohio. In 1932, Rebecca's grandson Fred Bateson visited the Warners in Arcola, IL, and the following year Rebecca's granddaughter Kate Hite attended Nancy's funeral in Arcola. Later in life, Rebecca lived with her widowed son Samuel at his home at Bateson Beach. She is seen here in front of the sizable house, wearing a dark top, standing between friend Mildred Parian (left) and great-granddaughter Bertha (Bateson) Bugh (right), with son Sam seated. Click here to see an enlarged view of this image. Tragedy struck the family in 1884 when son William accidentally drowned in Buckeye Lake while out hunting and fishing. How he met his untimely demise was always considered a mystery, and stories of it were told for many years among family and friends..
Grandson Fred Bateson successfully developed many lots of the family's ancient beachfront property at Buckeye Lake that today is named for the family -- "Bateson Beach." 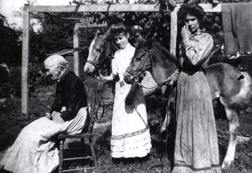 In the photo seen here, Rebecca is seated in profile, with granddaughters Bertha Bugh, left, and Stella (Shell) Bateson, right, and two family horses in front of a trellis of vines. My mother lacked a few days of reaching the century mark, and I well remember her last days. We all wanted to see her reach the century mark and all prayed for that but she was taken away just two days before she was 100 years old. My grandfather, however, lived to be 104 and nearly all of the family on my mother's side lived longer than the average span of life. Rebecca actually lived to be 99½. Many times before her death, said her newspaper obituary, "she expressed her readiness to leave this world and meet her savior." She passed away on Sept. 18, 1914 and is buried in an unmarked grave at the Union Baptist cemetery near Thornville. Among the traditional mymns sung at her funeral were "Asleep in Jesus," "Some Sweet Day" and "It Is Well with My Soul." Rebecca's grave is not marked. In August 1994, the founder of this website and Minerd-Minard-Miner-Minor genealogist Eugene Podraza visited the cemetery but did not see any marker of any kind. The fates of Rebecca's husband -- and daughter Margaret -- are not known.